For other uses, see Llama (disambiguation). Not to be confused with Lama, a Tibetan monk. The llama (/ˈlɑːmə/; Spanish pronunciation: [ˈʎama]) (Lama glama) is a domesticated South American camelid, widely used as a meat and pack animal by Andean cultures since the Pre-Columbian era. A full-grown llama can reach a height of 1.7 to 1.8 m (5 ft 7 in to 5 ft 11 in) at the top of the head, and can weigh between 130 and 200 kg (290 and 440 lb). At birth, a baby llama (called a cria) can weigh between 9 and 14 kg (20 and 31 lb). Llamas typically live for 15 to 25 years, with some individuals surviving 30 years or more. They are very social animals and live with other llamas as a herd. The wool produced by a llama is very soft and lanolin-free. Llamas are intelligent and can learn simple tasks after a few repetitions. When using a pack, they can carry about 25 to 30% of their body weight for 8 to 13 km (5–8 miles). Llamas appear to have originated from the central plains of North America about 40 million years ago. They migrated to South America about three million years ago during the Great American Interchange. By the end of the last ice age (10,000–12,000 years ago), camelids were extinct in North America. As of 2007, there were over seven million llamas and alpacas in South America, and due to importation from South America in the late 20th century, there are now over 158,000 llamas and 100,000 alpacas in the United States and Canada. Lamoids, or llamas (as they are more generally known as a group), consist of the vicuña (Vicugna vicugna, prev. Lama vicugna), guanaco (Lama guanicoe), Suri alpaca, and Huacaya alpaca (Vicugna pacos, prev. Lama guanicoe pacos), and the domestic llama (Lama glama). Guanacos and vicuñas live in the wild, while llamas and alpacas exist only as domesticated animals. Although early writers compared llamas to sheep, their similarity to the camel was soon recognized. They were included in the genus Camelus along with alpaca in the Systema Naturae (1758) of Carl Linnaeus. They were, however, separated by Georges Cuvier in 1800 under the name of lama along with the guanaco. DNA analysis has confirmed that the guanaco is the wild ancestor of the llama, while the vicuña is the wild ancestor of the alpaca, and thus the latter were placed in the genusVicugna. 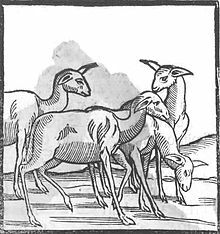 The genera Lama and Vicugna are, with the two species of true camels, the sole existing representatives of a very distinct section of the Artiodactyla or even-toed ungulates, called Tylopoda, or "bump-footed", from the peculiar bumps on the soles of their feet. The Tylopoda consist of a single family, the Camelidae, and shares the order Artiodactyla with the Suina (pigs), the Tragulina (chevrotains), the Pecora (ruminants), and the Whippomorpha (hippos and cetaceans, which belong to Artiodactyla from a cladistic, if not traditional, standpoint). The Tylopoda have more or less affinity to each of the sister taxa, standing in some respects in a middle position between them, sharing some characteristics from each, but in others showing special modifications not found in any of the other taxa. The 19th-century discoveries of a vast and previously unexpected extinct Paleogene fauna of North America, as interpreted by paleontologists Joseph Leidy, Edward Drinker Cope, and Othniel Charles Marsh, aided understanding of the early history of this family. Llamas were not always confined to South America; abundant llama-like remains were found in Pleistocene deposits in the Rocky Mountains and in Central America. Some of the fossil llamas were much larger than current forms. Some species remained in North America during the last ice ages. North American llamas are categorized as a single extinct genus, Hemiauchenia. Llama-like animals would have been a common sight 25,000 years ago, in modern-day California, Texas, New Mexico, Utah, Missouri, and Florida. The camelid lineage has a good fossil record. Camel-like animals have been traced from the thoroughly differentiated, modern species back through early Miocene forms. Their characteristics became more general, and they lost those that distinguished them as camelids; hence, they were classified as ancestral artiodactyls. No fossils of these earlier forms have been found in the Old World, indicating that North America was the original home of camelids, and that Old World camels crossed over via the Bering Land Bridge. The formation of the Isthmus of Panama three million years ago allowed camelids to spread to South America as part of the Great American Interchange, where they evolved further. Meanwhile, North American camelids died out at the end of the Pleistocene. The following characteristics apply especially to llamas. Dentition of adults:-incisors 1/3 canines 1/1, premolars 2/2, molars 3/2; total 32. In the upper jaw, a compressed, sharp, pointed laniariform incisor near the hinder edge of the premaxilla is followed in the male at least by a moderate-sized, pointed, curved true canine in the anterior part of the maxilla. The isolated canine-like premolar that follows in the camels is not present. The teeth of the molar series, which are in contact with each other, consist of two very small premolars (the first almost rudimentary) and three broad molars, constructed generally like those of Camelus. In the lower jaw, the three incisors are long, spatulate, and procumbent; the outer ones are the smallest. Next to these is a curved, suberect canine, followed after an interval by an isolated minute and often deciduous simple conical premolar; then a contiguous series of one premolar and three molars, which differ from those of Camelus in having a small accessory column at the anterior outer edge. The skull generally resembles that of Camelus, the larger brain-cavity and orbits and less-developed cranial ridges being due to its smaller size. The nasal bones are shorter and broader, and are joined by the premaxilla. The ears are rather long and slightly curved inward, characteristically known as "banana" shaped. There is no dorsal hump. The feet are narrow, the toes being more separated than in the camels, each having a distinct plantar pad. The tail is short, and fibre is long, woolly and soft. In essential structural characteristics, as well as in general appearance and habits, all the animals of this genus very closely resemble each other, so whether they should be considered as belonging to one, two, or more species is a matter of controversy among naturalists. The question is complicated by the circumstance of the great majority of individuals that have come under observation being either in a completely or partially domesticated state. Many are also descended from ancestors that have previously been domesticated, a state that tends to produce a certain amount of variation from the original type. The four forms commonly distinguished by the inhabitants of South America are recognized as distinct species, though with difficulties in defining their distinctive characteristics. 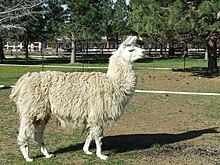 The llama and alpaca are only known in the domestic state, and are variable in size and of many colors, being often white, brown, or piebald. Some are grey or black. The guanaco and vicuña are wild, the former being endangered, and of a nearly uniform light-brown color, passing into white below. They certainly differ from each other, the vicuña being smaller, more slender in its proportions, and having a shorter head than the guanaco. The vicuña lives in herds on the bleak and elevated parts of the mountain range bordering the region of perpetual snow, amidst rocks and precipices, occurring in various suitable localities throughout Peru, in the southern part of Ecuador, and as far south as the middle of Bolivia. Its manners very much resemble those of the chamois of the European Alps; it is as vigilant, wild, and timid. The fiber is extremely delicate and soft, and highly valued for the purposes of weaving, but the quantity that each animal produces is minimal. Alpacas are descended from wild vicuna ancestors, while domesticated llamas are descended from wild guanaco ancestors, though a considerable amount of hybridization between the two species has occurred. Differential characteristics between llamas and alpacas include the llama's larger size, longer head, and curved ears. Alpaca fiber is generally more expensive, but not always more valuable. Alpacas tend to have a more consistent color throughout the body. The most apparent visual difference between llamas and camels is that camels have a hump or humps and llamas do not. Llamas are not ruminants, pseudo-ruminants, or modified ruminants. They have a complex stomach with several compartments that allows them to consume lower quality, high cellulose foods. The stomach compartments allow for fermentation of tough food stuffs, followed by regurgitation and re-chewing. Ruminants have four compartments (cows, sheep, goats), whereas llamas have only three stomach compartments: the rumen, omasum, and abomasum. In addition, the llama (and other camelids) have an extremely long and complex large intestine (colon). The large intestine's role in digestion is to reabsorb water, vitamins and electrolytes from food waste that is passing through it. The length of the llama's colon allows it to survive on much less water than other animals. This is a major advantage in arid climates where they live. Llamas have an unusual reproductive cycle for a large animal. Female llamas are induced ovulators. Through the act of mating, the female releases an egg and is often fertilized on the first attempt. Female llamas do not go into estrus ("heat"). Like humans, llama males and females mature sexually at different rates. Females reach puberty at about 12 months old; males do not become sexually mature until around three years of age. Llamas mate with the female in a kush (lying down) position, which is fairly unusual in a large animal. They mate for an extended time (20–45 minutes), also unusual in a large animal. The gestation period of a llama is 11.5 months (350 days). Dams (female llamas) do not lick off their babies, as they have an attached tongue that does not reach outside of the mouth more than half an inch (1.3 cm). Rather, they will nuzzle and hum to their newborns. A cria (from Spanish for "baby") is the name for a baby llama, alpaca, vicuña, or guanaco. Crias are typically born with all the females of the herd gathering around, in an attempt to protect against the male llamas and potential predators. Llamas give birth standing. Birth is usually quick and problem-free, over in less than 30 minutes. Most births take place between 8 am and noon, during the warmer daylight hours. This may increase cria survival by reducing fatalities due to hypothermia during cold Andean nights. This birthing pattern is speculated to be a continuation of the birthing patterns observed in the wild. Crias are up and standing, walking and attempting to suckle within the first hour after birth. Crias are partially fed with llama milk that is lower in fat and salt and higher in phosphorus and calcium than cow or goat milk. A female llama will only produce about 60 ml (2.1 imp fl oz) of milk at a time when she gives milk, so the cria must suckle frequently to receive the nutrients it requires. In harem mating, the male is left with females most of the year. For field mating, a female is turned out into a field with a male llama and left there for some period of time. This is the easiest method in terms of labor, but the least useful in terms of prediction of a likely birth date. An ultrasound test can be performed, and together with the exposure dates, a better idea of when the cria is expected can be determined. Hand mating is the most efficient method, but requires the most work on the part of the human involved. A male and female llama are put into the same pen and mating is monitored. They are then separated and re-mated every other day until one or the other refuses the mating. Usually, one can get in two matings using this method, though some stud males routinely refuse to mate a female more than once. The separation presumably helps to keep the sperm count high for each mating and also helps to keep the condition of the female llama's reproductive tract more sound. If the mating is not successful within two to three weeks, the female is mated again. Llamas should be tested for pregnancy after mating at two to three, six and at least 12 weeks. For "spit" testing, bring the potentially pregnant dam to an intact male. If the stud attempts to mate with her and she lies down for him within a fairly short period of time, she is not pregnant. If she remains on her feet, spits, attacks him, or otherwise prevents his being able to mate, it is assumed she is probably pregnant. This test gets its name due to the dam spitting at the male if she is pregnant. For progesterone testing, a veterinarian can test a blood sample for progesterone. A high level can indicate a pregnancy. With palpation, the veterinarian or breeder manually feels inside the llama to detect a pregnancy. Some risks to the llama exist, but it can be an accurate method for pregnancy detection. Ultrasound is the most accurate method for an experienced veterinarian, who can do an exterior examination and detect a fetus as early as 45 days. Spit testing with an intact male is generally free and is usually accurate. However, some hormonal conditions in females can make them reject a male when they are in fact not pregnant, and, more rarely, accept a male when they are pregnant. Progesterone tests can give a high reading in some females with a hormonal problem that are in fact not pregnant. Neither of the previous methods, nor palpation, can give a reasonably accurate idea of the age of the fetus, while an ultrasound procedure can. In addition, an ultrasound procedure can distinguish between pregnancy and misleading physical conditions, or between a live and dead fetus. The disadvantages of an ultrasound procedure are cost, some training in the use of ultrasound equipment is required, and not all veterinarians have the equipment needed to perform the examination. Options for feeding llamas are quite wide; a wide variety of commercial and farm-based feeds are available. The major determining factors include feed cost, availability, nutrient balance and energy density required. Young, actively growing llamas require a greater concentration of nutrients than mature animals because of their smaller digestive tract capacities. Estimated daily requirements[clarification needed (what units?)] of bromgrass hay, alfalfa hay and corn silage on an as-fed and 100% dry matter basis for llamas from 22 to 550 pounds. Llamas, which are well-socialized and trained to halter and lead after weaning, are very friendly and pleasant to be around. They are extremely curious and most will approach people easily. However, llamas that are bottle-fed or over-socialized and over-handled as youth will become extremely difficult to handle when mature, when they will begin to treat humans as they treat each other, which is characterized by bouts of spitting, kicking and neck wrestling. When correctly reared, llamas spitting at a human is a rare thing. Llamas are very social herd animals, however, and do sometimes spit at each other as a way of disciplining lower-ranked llamas in the herd. A llama's social rank in a herd is never static. They can always move up or down in the social ladder by picking small fights. This is usually done between males to see which will become dominant. Their fights are visually dramatic, with spitting, ramming each other with their chests, neck wrestling and kicking, mainly to knock the other off balance. The females are usually only seen spitting as a means of controlling other herd members. While the social structure might always be changing, they live as a family and they do take care of each other. If one notices a strange noise or feels threatened, a warning bray is sent out and all others become alert. They will often hum to each other as a form of communication. The sound of the llama making groaning noises or going "mwa" (/mwaʰ/) is often a sign of fear or anger. If a llama is agitated, it will lay its ears back. One may determine how agitated the llama is by the materials in the spit. The more irritated the llama is, the further back into each of the three stomach compartments it will try to draw materials from for its spit. An "orgle" is the mating sound of a llama or alpaca, made by the sexually aroused male. The sound is reminiscent of gargling, but with a more forceful, buzzing edge. Males begin the sound when they become aroused and continue throughout the act of procreation – from 15 minutes to more than an hour. Using llamas as livestock guards in North America began in the early 1980s, and some sheep producers have used llamas successfully since then. Some would even use them to guard their smaller cousins, the alpaca. They are used most commonly in the western regions of the United States, where larger predators, such as coyotes and feral dogs, are prevalent. Typically, a single gelding (castrated male) is used. Research suggests the use of multiple guard llamas is not as effective as one. Multiple males tend to bond with one another, rather than with the livestock, and may ignore the flock. A gelded male of two years of age bonds closely with its new charges and is instinctively very effective in preventing predation. Some llamas appear to bond more quickly to sheep or goats if they are introduced just prior to lambing. Many sheep and goat producers indicate a special bond quickly develops between lambs and their guard llama and the llama is particularly protective of the lambs. This sculpture, originating from the Chancay Valley and adjacent Chillón Drainage region (Late Intermediate Period), captures the llama's natural inquisitiveness. The Walters Art Museum. Scholar Alex Chepstow-Lusty has argued that the switch from a hunter-gatherer lifestyle to widespread agriculture was only possible because of the use of llama dung as fertilizer. The Moche people frequently placed llamas and llama parts in the burials of important people, as offerings or provisions for the afterlife. 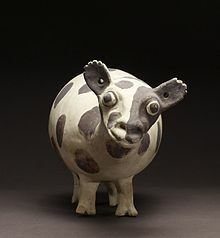 The Moche culture of pre-Columbian Peru depicted llamas quite realistically in their ceramics. In the Inca Empire, llamas were the only beasts of burden, and many of the people dominated by the Inca had long traditions of llama herding. For the Inca nobility, the llama was of symbolic significance, and llama figures were often buried with the dead. In South America, llamas are still used as beasts of burden, as well as for the production of fiber and meat. The Inca deity Urcuchillay was depicted in the form of a multicolored llama. Carl Troll has argued that the large numbers of llamas found in the southern Peruvian highlands were an important factor in the rise of the Inca Empire. 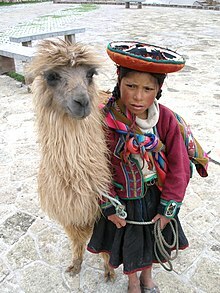 It is worth considering the maximum extent of the Inca Empire roughly coincided with the greatest distribution of alpacas and llamas in Pre-Hispanic America. The link between the Andean biomes of puna and páramo, llama pastoralism and the Inca state is a matter of research. One of the main uses for llamas at the time of the Spanish conquest was to bring down ore from the mines in the mountains. Gregory de Bolivar estimated that in his day, as many as 300,000 were employed in the transport of produce from the Potosí mines alone, but since the introduction of horses, mules, and donkeys, the importance of the llama as a beast of burden has greatly diminished. According to Juan Ignacio Molina, the Dutch captain Joris van Spilbergen observed the use of hueques (possibly a llama type) by native Mapuches of Mocha Island as plow animals in 1614. In Chile hueque populations declined towards extinction in the 16th and 17th century being replaced by European livestock. 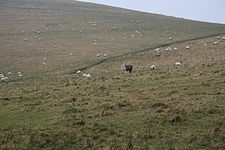 The causes of its extinction are not clear but it is known that the introduction of sheep caused some competition among both domestic species. Anecdotal evidence of the mid-17th century show that both species coexisted but suggests that there were many more sheep than hueques. The decline of hueques reached a point in the late 18th century when only the Mapuche from Mariquina and Huequén next to Angol raised the animal. Llamas have a fine undercoat, which can be used for handicrafts and garments. The coarser outer guard hair is used for rugs, wall-hangings and lead ropes. The fiber comes in many different colors ranging from white or grey to reddish-brown, brown, dark brown and black. The Emperor's New Groove, a 2000 animated Disney film where an Incan emperor gets turned into a llama. ^ "Llama Characteristics". Nose-n-Toes. 25 June 2007. ^ "Llama Facts 1". Llamas of Atlanta. 25 June 2007. ^ "Llama FAQ". Twin Creeks Llamas. 25 June 2007. ^ a b "Llama". Oklahoma State University. 25 June 2007. ^ Oxford English Dictionary, 2nd edition, "llama"
^ South Central Llama Association (22 January 2009). "Llama Facts 2". ^ Perry, Roger (1977). Wonders of Llamas. Dodd, Mead & Company. p. 7. ISBN 0-396-07460-X. ^ Murray E. Fowler (1998). Medicine and Surgery of South American Camelids. Wiley-Blackwell. p. 1. ISBN 0-8138-0397-7. ^ "Lama". Integrated Taxonomic Information System. Retrieved 5 January 2013. ^ Wheeler, Dr Jane; Miranda Kadwell; Matilde Fernandez; Helen F. Stanley; Ricardo Baldi; Raul Rosadio; Michael W. Bruford (December 2001). "Genetic analysis reveals the wild ancestors of the llama and the alpaca". Proceedings of the Royal Society B: Biological Sciences. 268 (1485): 2575–2584. doi:10.1098/rspb.2001.1774. PMC 1088918. PMID 11749713. 0962-8452 (Paper) 1471–2954 (Online). ^ Kurtén, Björn; Anderson, Elaine (1980). Pleistocene Mammals of North America. New York: Columbia University Press. p. 307. ISBN 0231037333. ^ Grayson, Donald K. (1991). "Late Pleistocene mammalian extinctions in North America: Taxonomy, chronology, and explanations". Journal of World Prehistory. Springer Netherlands. 5 (3): 193–231. doi:10.1007/BF00974990. ^ "Dental Anatomy of Llamas". www.vivo.colostate.edu. ^ Themes, U. F. O. (1 October 2016). "Camelids Are Not Ruminants". ^ Greta Stamberg & Derek Wilson (12 April 2007). "Induced Ovulation". Llamapaedia. Archived from the original on 12 April 2007. ^ L. W. Johnson (17 April 2007). "Llama reproduction". College of Veterinary Medicine and Biomedical Sciences, Colorado State University, Fort Collins. National Library of Medicine and the National Institutes of Health. ^ Chris Cebra; David E. Anderson; Ahmed Tibary; Robert J. Van Saun; LaRue Willard Johnson (15 February 2014). Llama and Alpaca Care: Medicine, Surgery, Reproduction, Nutrition, and Herd Health. Elsevier Health Sciences. ISBN 978-0-323-24291-2. ^ "The llama reproductive cycle". LlamaWeb. 17 April 2007. Archived from the original on 3 March 2007. ^ The Department of Veterninary Clinical Sciences at Ohio State University (2002). Camelid Medicine, Surgery, and Reproduction for Veterinarians. Part II. ^ Long, Patrick O. (1996). Llama & Alpaca Neonatal Care. p. 112. ISBN 0-9646618-3-7. ^ Birutta, Gale (1997). A Guide to Raising Llamas. p. 327. ISBN 0-88266-954-0. ^ Linda March. "Llamas: A Different Kind of Pet". University of Illinois, College of Veterinary Medicine. Archived from the original on 11 December 2012. Retrieved 15 May 2009. ^ Randy Sell (17 April 2007). "Llama". Department of Agricultural Economics, North Dakota State University. ^ Murray E. Fowler, DVM (1989). "Medicine and Surgery of South American Camelids; Llama, Alpaca, Vicuña, Guanaco". Iowa State University Press. ^ Britton, Rick (24 May 2001). "Llama farmers say beasts no burden". Washington Times. p. 14. ^ Greta Stamberg & Derek Wilson (2 September 1997). "Behavior: Sounds". Llamapedia. Archived from the original on 15 October 2006. ^ Brian and Jane Pinkerton (17 May 2008). "Llama Sounds". Humm Page. Archived from the original on 9 May 2008. ^ International Llama Association. (1995). "Guard Llamas." ILA Educational Brochure No. 2. ^ Walker, Cameron. "Guard Llamas Keep Sheep Safe From Coyotes." National Geographic, 10 June 2003. 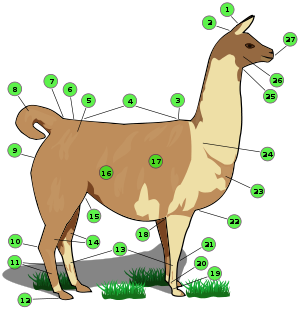 ^ "Guard Llamas: An Alternative for Effective Predator Management". ^ "Llama Effigy". The Walters Art Museum. ^ Anning, Caroline. (2011-05-22) BBC News – Inca success in Peruvian Andes 'thanks to llama dung'. BBC.co.uk. Retrieved on 2011-08-21. ^ Berrin, Katherine & Larco Museum. The Spirit of Ancient Peru:Treasures from the Museo Arqueológico Rafael Larco Herrera. New York: Thames & Hudson, 1997 ISBN 0-500-01802-2. ^ "Little Llamas". 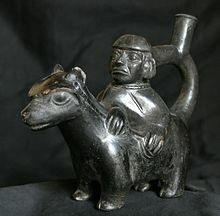 Inca culture. 10 October 2006. Archived from the original on 7 September 2006. ^ D'Altroy, Terence N. (2002). "The Inca Pantheon". The Incas. The People of America. Oxford: Blackwell Publishing. p. 149. ISBN 978-0-631-17677-0. ^ Gade, Daniel (2016). "Urubamba Verticality: Reflections on Crops and Diseases". Spell of the Urubamba: Anthropogeographical Essays on an Andean Valley in Space and Time. p. 86. ISBN 978-3-319-20849-7. ^ Hardoy, Jorge Henríque (1973). Pre-Colombian Cities. p. 24. ISBN 978-0802703804. ^ Gade, Daniel W. (1996). "Carl Troll on Nature and Culture in the Andes (Carl Troll über die Natur und Kultur in den Anden)". Erdkunde. 50 (4): 301–316. ^ Jared Diamond (12 April 2007). "Guns, Germs & Steel. The Show: Episode Two". PBS. ^ Jared Diamond (12 April 2007). "Guns, Germs & Steel. The story of ... Llamas". PBS. ^ Juan Bautista Ignacio Molina (1808). The geographical, natural and civil history of Chili, tr. by an American gentleman. II. pp. 15–16. Retrieved 22 August 2011. ^ a b Bonacic, Cristián (1991). Características biológicas y productivas de los camélidos sudamericanos Archived 4 March 2016 at the Wayback Machine. Avances en ciencias veterinarias. Vol. 6, No. 2. ^ a b c Torrejón, Fernando; Cisternas, Marco; Araneda, Alberto (2004). "Efectos ambientales de la colonización española desde el río Maullín al archipiélago de Chiloé, sur de Chile" [Environmental effects of the spanish colonization from de Maullín river to the Chiloé archipelago, southern Chile]. Revista Chilena de Historia Natural (in Spanish). 77: 661–677. ^ Beula Williams (17 April 2007). "Llama Fiber". International Llama Association. "Llama" . Encyclopædia Britannica. 16 (11th ed.). 1911. p. 829. 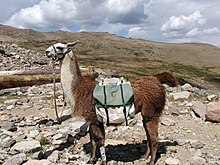 Wikimedia Commons has media related to Llama. "Llamapaedia Orgle Sound". Archived from the original (AIFF) on 30 October 2007. "Llama" . Encyclopedia Americana. 1920.